Gingerbread donuts are a festive way to celebrate Christmas morning. Coated in cinnamon sugar, these baked donuts are easy to make in a donut tin. The holidays wouldn’t be the same without some gingerbread, now would it? Baked gingerbread donuts are just what you need this time of year. Coated in ginger cinnamon sugar, these donuts are fluffy and flavorful. The recipe calls for festive spices—cinnamon, ginger, all spice and cloves. If you have a donut tin, these donuts couldn’t be easier to make! Homemade donuts are so good. I always forget how good until I get a sudden urge for the breakfast treat and head into the kitchen and bake them. Before starting any breakfast recipe, however, I first pour myself a cup of coffee. I’ve been using the Hamilton Beach FlexBrew Coffee to make for my morning coffee these days. Depending on the day, I either brew myself a single cup of coffee or start a pot if I have a long day of baking ahead of me. After making myself some coffee, I baked some gingerbread donuts. The recipe is easy to follow—simply whisk together the dry ingredients in one bowl and mix the wet ingredients in another, then combine the two and stir until incorporated! 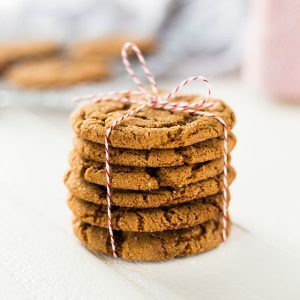 The key flavor ingredients in this recipe are the spices (especially the ginger) and the molasses. Together they create the undeniable gingerbread taste that immediately puts you in the Christmas mood. The donuts bake in about 15 minutes. I like to dip them in melted butter and cinnamon sugar while they are still warm so I can eat them fresh out of the oven with my morning coffee. To make these donuts a little different, I added some ground ginger to the cinnamon sugar coating to ensure the most festive flavor. The coating literally melts in your mouth when you take the first bite. 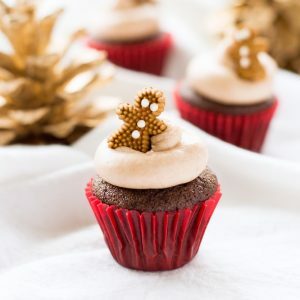 Gingerbread donuts will certainly put you in the holiday mood and if you’re doing some Christmas shopping, add the Hamilton Beach FlexBrew Coffee Maker to your list. Use code 10FLEXBREW for 10% off the FlexBrew on Amazon. Bake yourself a batch of donuts, pour yourself some coffee and enjoy! In a medium mixing bowl, whisk together flour, ginger, cinnamon, ground cloves, ground all spice, baking powder, baking soda, and salt. Set aside. Add flour mixture to the wet ingredients and stir just until combined. Avoid over mixing. Using a spoon, pour batter into donut tins. The tins will be full. Bake for about 13 to 15 minutes, or until donut springs back when lightly touched. 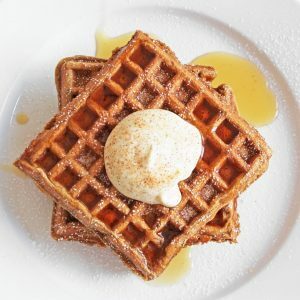 In a wide, shallow dish, whisk together the granulated sugar, cinnamon, and ginger. Dip the tops and bottoms of warm donuts into the melted butter, then immediately into the spiced sugar mixture. Serve immediately. The donut pans I used had cavities 2.25 inches in diameter. You may see tiny bits of yogurt in the batter. That is okay. Avoid over mixing the batter. I have a donut pan that creates six donuts so do you suggest filling them to the top or half full? Which mini donut pan do you like? I could eat these every morning with my coffee! They pair so well! They look delicious too! These are the perfect donuts for me. I love all your flavors. Donuts and coffee the perfect pairing. 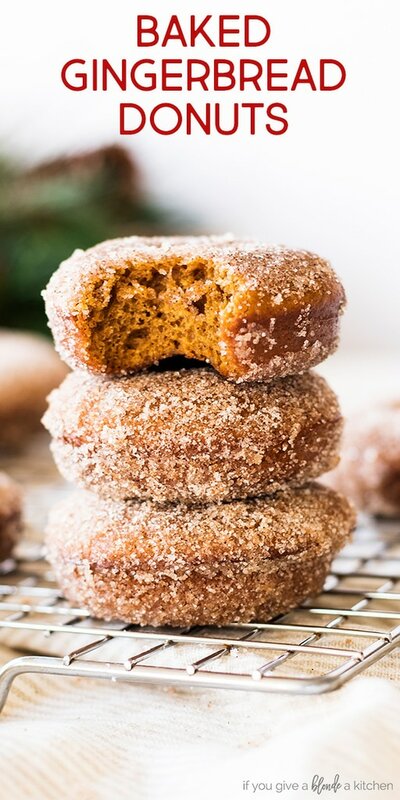 These Ginger Bread Doughnuts and its Flavor of Ginger and Cinnamon is awesome. These will be made for Christmas Breakfast for the Family. Oh yum! My whole family would go crazy for these donuts! This is so delicious and it makes my mouth watering. OMG Hayley, I loved these!! What a great idea with the gingerbread and donut combination of flavours, yummo!! Perfect for Christmas. Thanks for sharing, I really enjoyed reading this one and looking at the pics! What can I replace molasses with please? 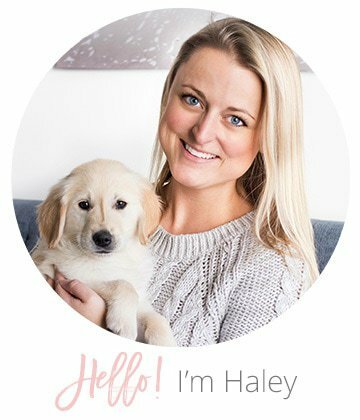 Hi Helen – I don’t suggest a substitution for this as it adds a lot of flavor to the donuts. If you must substitute, use honey. 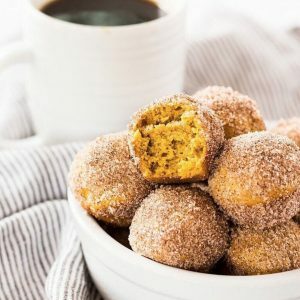 I don’t have a donut pan and I wondered if I could do the donut holes with this recipe? Will it go well? Thanks. Hi Hannah! Yes, you can use a mini muffin tin for this recipe. Reduce the baking time to 9-10 minutes. They are done when a toothpick inserted in the center comes out clean. Making these gems as we speak! Yay! I could go for another batch myself. Enjoy!